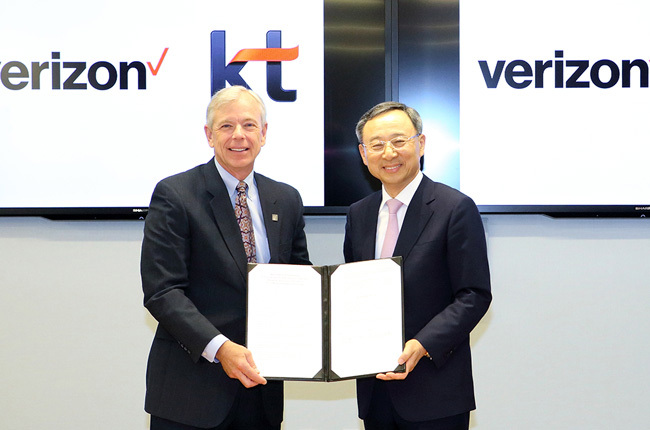 Verizon Communications (VZ) and Korea Telecom (KT) will collaborate on development of 5G wireless technology ahead of a planned 2018 demonstration of the proposed standard. Up till recently, it appeared VZ didn’t agree as the US carrier had announced 5G trials before ITU-R even defined what 5G is and the specs aren’t to be finalized till the end of 2020. VZ inked a partnership with Samsung to make their 5G trials real. Carriers and manufacturers are making their 5G speed tests public, but until a global standard is established, it is difficult to gauge the accuracy of the 5G speed tests by the companies. Proposed rate regulation for business data services by the Federal Communications Commission could slow deployment of 5G wireless, said USTelecom President Walter McCormick. The commission is ignoring significant evidence of a rapidly growing and competitive marketplace, he said. “If winning the race to new 5G wireless is the goal, then incenting investment is key,” McCormick said. Forcing facilities-based providers that are investing in business data services to lease their networks at FCC-set discount prices to companies that are opting against investment will discourage deployment of the infrastructure America needs to support new 5G services.